Third and final book in the Inkheart Trilogy. 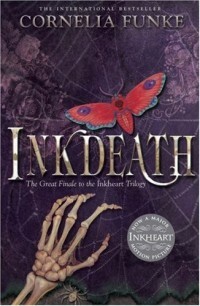 My review of Inkheart (#1) can be found here and of Inkspell (#2) here. WARNING: contains ever so slight spoilers for the previous books. It's by far the darkest of the books, but I must admit I never felt the thrill. It got dark and it was fairly boring. The oh so terrible cruel monstrous villains I never felt any fear of. It's a bit like watching a modern Disney film. No matter how gruesome the villains are, you don't feel a thing, because you know it will all end happy anyhow. I do still love the concept of a book within a book. Especially the thoughts given to who is actually writing the story now. It's somewhat a show down between Fenoglio (the "author") and Orpheus (the wannabe). The main characters still annoy me. I never feel like I properly get to know them and understand them. We get a bit closer to Mo in this book, but Resa is still just fluttering all over the place and Meggie is the heroine who's asked to be quiet while the menfolk save the day. Dustfinger is quite brilliant though (also, imagining him as Paul Bettany who plays the part in Inkheart, the film, helps). I did overall enjoy the book though. I'm happy to be done with the trilogy, but it was worth the read, and I do love the concept. I was really disappointed with this one - it felt like the characters were all different people and things ended completely differently to how it was suggested in the last two books. I loved the first two though.